With just over a month and a half before the Best Buddies Challenge, it is crunch time for those of us racing to meet our fundraising commitments. Whether you’ve been chipping away at your goal for almost a year now, you’ve just joined recently or you’ve been procrastinating (easy to do, we know), here are some tips to help you make the most of the remaining weeks. 2.) LOSE YOUR INHIBITIONS ABOUT ASKING FOR MONEY. Re-frame your thinking about fundraising and you’ll find it easier to reach out and ask for money. It’s a selfless act that will benefit other people. It’s great to feel proud of what you’d doing; others will notice and feel proud to support the cause too. 3.) KNOW YOUR CAUSE. Take a few minutes to read the “About the Cause” page on the Best Buddies website and learn as much as you can before you start fundraising. Same goes for the MTeam, and the connection between the two. 4.) MAKE A LIST. Spend a few minutes brainstorming a list of everyone you can think of who might be willing to donate. Write them down. Work through your list with personal messages or, if possible, ask in person. Make notes. If you have a positive response, don’t forget to follow up if you don’t hear from them in a few days or a week later. 5.) ASK AND ASK AGAIN. One ask for donations is easy to ignore, especially on social media. Ask again and again. Social media posts don’t reach all of your followers. One ask by email or text or in person can be forgotten. Repeat and, if you have a positive response, follow up again if needed. 6.) ASK IN PERSON. People are far more likely to donate when you ask in person and share your story. Follow up with a text or email that has your fundraising link. 7.) SEND EMAILS. You probably have a bigger contact list than you realize. Look through your address book and send personal, individual emails to anyone you think may consider supporting your campaign. 8.) MAKE IT PERSONAL. Know your “why” and your connection to your fundraising efforts. Perhaps you know Meredith or you have a child or another connection who could benefit from the work of Best buddies. Share this story when you’re asking for donations. 9.) LINK TO YOUR FUNDRAISING PAGE EVERYWHERE. From social media profiles to your email signature to your Whatsapp profile, there are plenty of places it’s possible to share a link. Don’t miss out on the opportunity. 10.) “THERMOMETIZE” YOUR PROGRESS. Keep your network up to date on where you are in the fundraising process with a thermometer visual. Tell them how close you are to reaching your goal and how much help you still need from them. Canva or a screenshot of your fundraising page work well for this. 11.) CONSIDER PAYDAY. Whether most people you know are paid weekly, bi-weekly or monthly, keep this in mind when you’re asking for donations. When it’s the end of a pay period, everyone is a bit more conscious about spending money, whereas if you catch them in the first few days after payday, they’ll be more comfortable giving to your cause. 12.) RECRUIT YOUR FRIENDS. Sign up a friend and you’ll both receive $100 in your campaign through our referral program. Plus, you’ll have a runner/rider buddy that you already know and can offer each other moral support as you continue fundraising. 13.) TALK ABOUT THE MTEAM. When you’re out and about with friends or meeting new people, talk about what you’re doing and why you got involved. You may find someone interested in making a donation. If you find someone who loves to run or cycle and may want to join the team, that’s worth a $100 donation through our referral program. 14.) EXPAND YOUR NETWORK. Ask connection and donors if they know anyone who would be interested in supporting Best Buddies. They may have a personal connection to someone with a disability and be particularly inclined to donate for disability inclusion. 15.) SHARE OUR CONTENT. 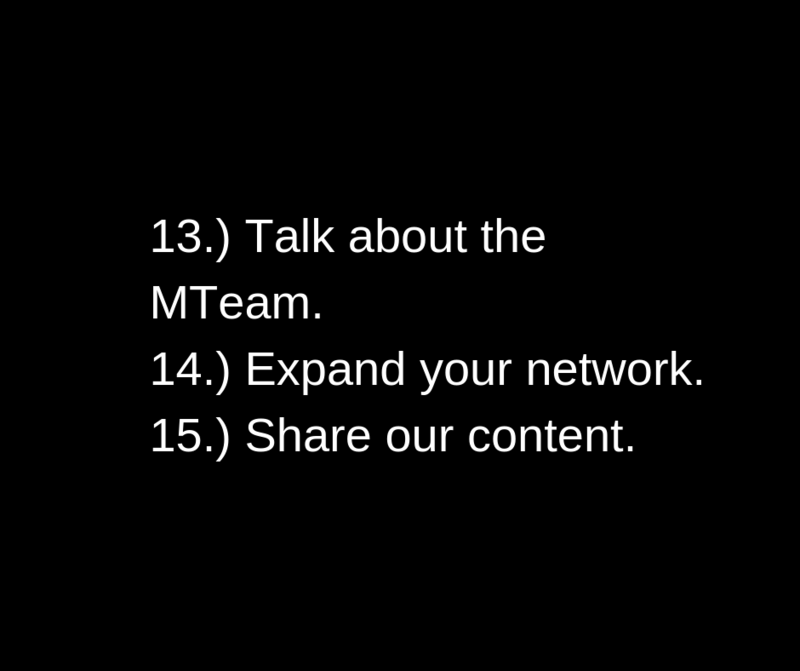 Follow the MTeam on social media and, if and when our social media or blog content resonates with you, share it with your own network, along with your own comments. This may be on your Facebook page or in your Instagram stories or wherever you hang out most. Find us on Facebook, Instagram, LinkedIn, Pinterest, Twitter and YouTube. Check out our blog too. 16.) USE VIDEO AND STORIES. If you’re asking for donations on social media, consider making a short video. A face and voice can add a new dimension to your request for donations and videos are easier to ignore. Stories show up at the top of the news feed and you can keep coming back as they disappear 24 hours later. 17.) LEAVE DONATION BOXES. It’s well worth asking around at your local cafes, shops, religious organizations or other places that have a high amount of foot traffic to see if you can leave a donation box, decorated to tell the MTeam story. 18.) CHECK FOR MATCHING FUNDS PROGRAMS. Many employers offer matching funds programs to their employees, and Best Buddies accepts these, so check in with the people who have made a donation and see if their company has something like this that can double their impact. 19.) ORGANIZE A BAKE SALE. If you have kids at a school or belong to a religious organization or can get your employer on board, see if you can gather fellow parents/worshippers/co-workers together to host a bake sale where the profits go into your fundraising campaign. 20.) HOST AN EVENT. Whether it’s a dinner, a movie night, a kids play date or a party, put in some extra effort and charge a small amount of “admission”, explaining to your guests that you’re hosting the event to raise a bit of money for your fundraising campaign. They will most likely be happy to go along with this. 21.) SET UP YOUR FACEBOOK BIRTHDAY CHARITY. If you’re lucky enough to have a birthday coming up, Facebook allows you to “donate” your birthday to a cause. Set it up as a personal cause rather than selecting Best Buddies so that you can manually transfer the funds to your own fundraising campaign rather than them going directly to Best Buddies. 22.) SUGGEST A GIVING EXCHANGE. If consumerism gets you down over the holiday season, suggest exchanging donations with a friend instead of physical presents this year. You could do the same for your birthday. 23.) SEND HANDWRITTEN NOTES. In a time where virtual communication rules and clutter is everywhere, a handwritten note may be just what is needed to stand out, whether you’re asking for donations or saying thank you. Use a short and memorable bit.ly link that can easily be typed into a browser. 24.) CLEAR YOUR CLUTTER & DONATE IN YOUR OWN NAME. While ideally your donations will come from others, there’s nothing wrong with taking advantage of spring cleaning and either hosting a yard sale or popping a bunch of listings up on eBay. Donate the profits to your own campaign. Making a donation under your name can also be a great way to encourage others as it shows you’re supporting your own cause, not just asking others for help. 25.) GET INTO THE COMPETITIVE SPIRIT! It’s not a competition, but make an effort to connect with other MTeamers in our private Facebook group where we share a weekly leaderboard each Friday. A friendly spirit of competition can help push us along. MTEAMERS: If you haven’t signed up yet, be sure to join our closed Facebook group for MTeamers where we’re encouraging all of you to share tips with one another.